CHICAGO--(BUSINESS WIRE)-- Hyatt Hotels Corporation (NYSE: H) announced today that a Hyatt affiliate has entered into a franchise agreement with Concord Aztec Brickell LLC for Hyatt Centric Brickell Miami, located at 1101 Brickell Ave. in the center of Miami’s thriving financial and business district. Concord Aztec Brickell LLC is a joint venture comprised of Aztec Group and Concord Hospitality, which will manage the hotel. 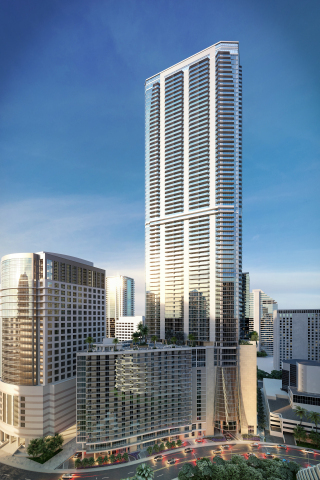 Hyatt Centric Brickell Miami is expected to conclude construction and open in Q3 2017. As with all Hyatt Centric hotels, Hyatt Centric Brickell Miami will place guests in the heart of the action, providing an ideal launch pad to explore downtown Miami and beyond. Located off Brickell Avenue, with views to Biscayne Bay, Hyatt Centric Brickell Miami will be part of the mixed-use 83-story Panorama Tower development that, when completed, will be home to the tallest building in Miami and the largest residential building south of New York. The first two floors of Panorama Tower will include more than 50,000 square feet of retail and restaurant space. Hyatt Centric Brickell Miami will offer 208 guestrooms, in addition to a signature second-floor restaurant and bar serving breakfast, lunch, dinner and 24-hour room service. The hotel will share a full-service spa, fitness center and pool with the building’s residences. All hotel guestrooms and suites will offer the Hyatt Centric brand’s signature amenities such as salon-grade Drybar Buttercup blowdryers, BeeKind eco-friendly bath and body products, Keurig in-room coffee brewing system and JBL Wireless speakers. With 4,000 square feet of meeting and event space, the hotel will provide business travelers with accessible spaces for group functions, both large and small. For more information on the Hyatt Centric brand, please visit hyattcentric.com. Founded in 1981, Aztec Group, Inc. specializes in facilitating the acquisition, disposition, financing and capital needs of real estate projects for institutional investors, entrepreneurs and commercial developers as well as offshore clients. Aztec has been long-recognized as the premier real estate capital markets intermediary and merchant banking firm in the Southeast, handling more than $10 billion in transactions during the past decade. The company is also considered an innovator, often seeing opportunities for clients before they become apparent in the marketplace. For more information, visit www.aztecgroup.com.